Most new tires are covered by a manufacturer's limited warranty that lasts until you exceed a certain mileage or their tread reaches a certain depth. The length of a manufacturer's mileage warranty varies depending on the tire's construction, and tread-life warranties can vary as well, but they typically end when tread depth reaches 2/32". Manufacturer's warranties also vary based on recommended applications for the tire, and some manufacturers offer no warranty outside of material defects or craftsmanship issues. Purchasing the Pep Boys Road Hazard Warranty is a worthy investment due to the variance of manufacturer's warranties and the cost of tires. Tires are built to strict standards, but they are still subject to failure. Impact damage, puncture, improper inflation, and incorrect use can lead to tire blowouts and tread separation. Road hazards, such as potholes, glass, metal, and other debris, can cause tire damage as well. With the Pep Boys Road Hazard Warranty, your tires are covered for more than just manufacturer's defects. Repair: Pep Boys will follow its puncture repair procedures to determine if your tire should be repaired or replaced under the road hazard warranty at no additional expense to you. Replacement: Under the Road Hazard Warranty, if your tire is unusable due to a road hazard-related occurrence and can’t be repaired, Pep Boys will replace the unusable tire or give you a refund. 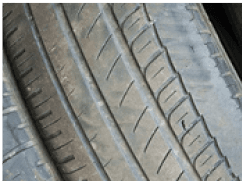 Both tire replacement and the refund are subject to a pro-rated adjustment, based on the remaining usable tread on the damaged tire. Length of coverage: Road Hazard Warranty coverage extends for the full period of the tire’s mileage rating. The coverage isn’t transferrable to a new owner of the tire. Coverage also ends if the tire is mounted on another vehicle other than the original. Speak with a Pep Boys tire specialist for more information regarding tire manufacturer warranties and our road hazard warranty.